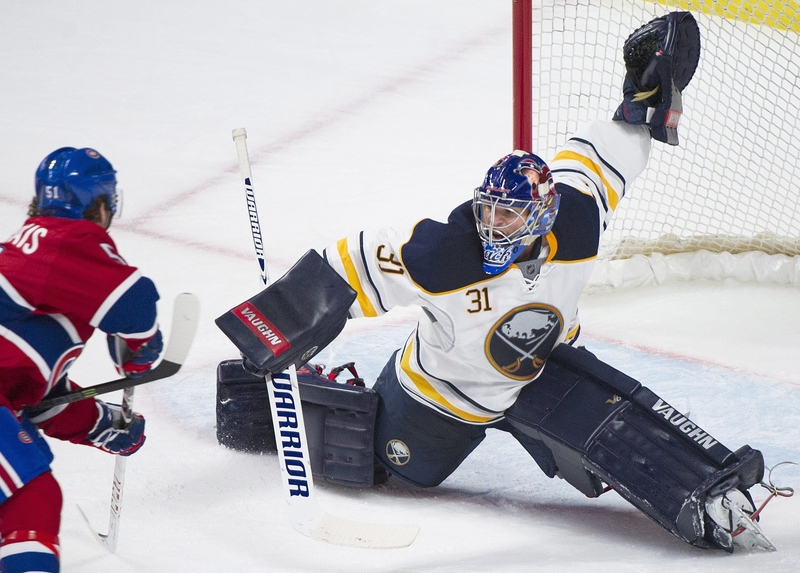 Matt Hackett has stopped 68 of 71 shots in his first two games with the Buffalo Sabres, going 1-1-0 in those starts. NASHVILLE, Tenn. — If there’s one thing Matt Hackett proved during his first two games with the Sabres, it’s that he deserves a third. He’ll get it tonight. Coach Ted Nolan is going back to Hackett against Nashville after the goaltender shined during a win over Edmonton and a 2-0 loss to Montreal on Tuesday. “Hackett definitely earned it,” Nolan said Wednesday in Bridgestone Arena. “That’s one thing about now, it’s audition time. When you audition and you do a couple good things in the auditions, you should get another one. Hackett stopped the Canadiens’ first 31 shots and finished with 33 stops. He turned aside 35 of 36 last week during a 3-1 win over the Oilers, the Sabres’ only victory in their last 10 outings. Hackett was in command in Montreal, which meant a lot to the 24-year-old. His uncle Jeff Hackett was a goalie for the Habs from 1998 to 2003. The first five questions of Nolan’s post-practice chat dealt with injured players. Obviously, things aren’t getting much better in Sabreland. Tyler Myers, Marcus Foligno, Torrey Mitchell and Zenon Konopka missed the Sabres’ workout with various ailments, while goaltender Michal Neuvirth was sent back to Buffalo for further evaluation of his lower-body injury. While Foligno should be back tonight, he’s the only definite. Myers is banged up after crashing into a goal post, Konopka is out with a back injury suffered on an airplane ride and Mitchell is unlikely to play after getting hurt in Montreal. It remains unclear whether goaltender Jhonas Enroth will play during the final 10 games. He has been recuperating in Buffalo after suffering a leg injury March 16. “We thought it was something and it wasn’t,” Nolan said. “Check another thing and it wasn’t that, either. They’re just doing evaluations, and we think it was what we originally thought it was – if that answers your question in a roundabout way. The Sabres’ penalty-kill unit has gone an impressive 15 for 17 during the last five games. Rather than be excited, it is lamenting a power-play goal scored by Daniel Briere with 3:06 left Tuesday. It ruined what had been a 5-for-5 night.